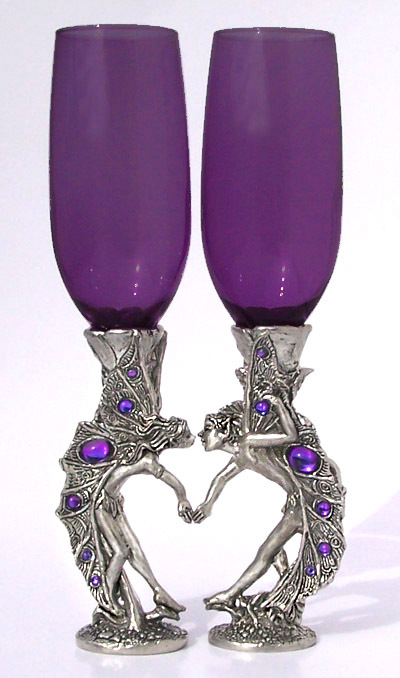 This pair of glasses is made up of a male and female fairy reaching out to hold hands as they kiss. They each have a tiny fairy perched on their other hand, and wings adorned on both sides with Austrian crystals matching the color of the glass. Each glass holds 8 ounces. *For our life-long GLASS REPAIR GUARANTEE go to "Cleaning & Glass Repair" near the top of our home-page. ** To see GLASS COLORS click on the "Color Chart" at the bottom of this page.